Scoring goals at Budweiser Gardens on Friday night was about as difficult as finding someone to put on your winter tires after the first snowfall of the season. 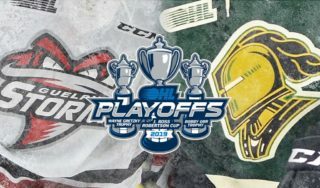 Joseph Raaymakers of the London Knights and Ukko-Pekka Luukkonen of the Sudbury Wolves put on a show, combining to make 65 saves in a 2-1 shootout win by the Knights that saw them stretch their unbeaten-in-regulation streak to 7-0-1. Knights forward Connor McMichael scored in the first period for London, while Blake Murray scored in the third period for the Wolves. Knights rookie Antonio Stranges had the only goal in the shootout. 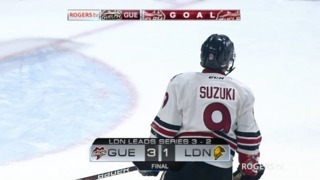 London had the edge in shots 41-26, allowing Luukkonen to show why he has been instrumental in Sudbury’s 10-win start to the season. Raaymakers’ work in the two games prior to Friday night saw him named CHL Goaltender of the Week, and he wound up stretching a shutout streak to 133 minutes. Raaymakers was named the game’s first star, stopping all three shots he faced in the shootout. Luukkonen was named the game’s second star. The Wolves are now 2-0-2 in their past four games. There seems to be some kind of cosmic connection between McMichael and the Mac Attack promotion at Budweiser Gardens. 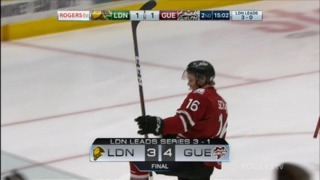 At some point during a London Knights game, two minutes is put up on the board and an announcement rings through the building that if the Knights score before the two minutes ends, everyone in attendance at Budweiser Gardens gets a Big Mac. McMichael did it twice early in the season, but with the Knights on the road in six of their past eight games, he hadn’t had many chances to try for a third Mac Attack goal. The two minutes popped up on the scoreboard as the Knights began a five-on-three power play in the first period. With two seconds remaining in a five-on-four man advantage, Matthew Timms found McMichael, got to the slot and ripped a shot past Luukkonen for a 1-0 London lead that had the elated crowd all set to chow down after the game. That nearly stood up as the only goal of the game. The Wolves were denied by Raaymakers again and again on quality chances but managed to tie the game at 11:26 of the third period as Murray got his stick on a puck in front and got it over the goal line to make it 1-1. The best chance of overtime came with 22.6 seconds remaining as Liam Foudy was awarded a penalty shot, only to be stopped by Luukkonen. The Knights will play their annual Remembrance Day game on Nov. 11 at home against the Kitchener Rangers. A ceremony to honour veterans will take place before the drop of the puck. London and the Rangers met on Nov. 4 at the Kitchener Memorial Auditorium as Formenton and Bouchard returned to the Knights’ lineup. Both scored a goal in a 3-0 London win. 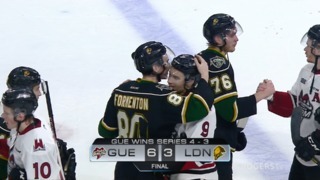 The Knights beat Kitchener 6-2 in October in the first meeting between the teams.